To be clear, this figure pertains to the percentage of people facing these problems at least once in their life, not the percentage of people facing them right now. Also, it should be noted that this figure cannot, by itself, be a sign of deteriorating economic security. To show things are deteriorating, you’d have to know whether this figure used to be lower than 80 percent, and we do not know that. Shortly after the AP report blew up, the Wall Street Journal’s James Taranto responded with a few criticisms that are worth reading. Taranto argues that using near-poverty to derive the figure (meaning 150 percent of the poverty line) instead of the poverty line is arbitrary. Taranto also takes issue with the joblessness part of the figure because it counts even a day of joblessness, and takes issue with counting anyone who has ever received welfare benefits into the figure as well. In light of Taranto’s criticisms, an interesting question presents itself: What would this figure look like if it did not include those features which Taranto objects to? If we used the poverty line instead of the near-poverty line and did not include joblessness or welfare receipt into the calculation, how much lower would the figure be? Lucky for us, in a variety of papers and books that came out in the late 1990s and early 2000s, Mark Rank and Thomas Hirschl published data on precisely this question. 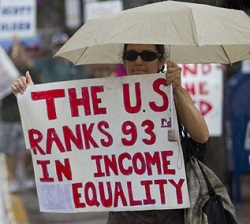 Read More The High Probability of Being Poor in America | Alternet. This entry was posted in News from the Soul Brother and tagged Economic Inequality, poverty, Poverty threshold, United States, Welfare. Bookmark the permalink.